A book like this -- which encourages young girls not just to run for president but to be leaders in school and in life in general -- has sadly never been more vital than it is in the wake of this election. On purpose alone, it gets 5 stars. I'd add another 5 for timing and another 5 for content -- it's charming for adults and perfectly aimed at the kids it needs to reach, and the photography that illustrates it is terrific -- but Goodreads doesn't really accommodate 15-star reviews, so 5 it is. 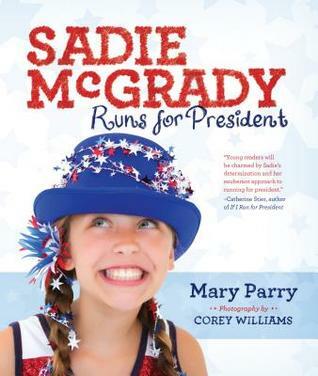 Sadie McGrady Runs for President is a timely book for this election year. It gives encouragement for girls especially that you can be anything you want to be with hard work. It was a nice touch having a picture book use all photographs. My 10y/o daughter really enjoyed the book. She read it several times. It came at the right time for her because she had the experience of running for an office at church (they were learning about the election process)! It was short and not overwhelming for her. Loved this book! A wonderful book for everyone. Sadie has my vote! Charming and adorable, this is a must-read for everyone and the perfect read-aloud!